Neat. Those dishes look super tasty. Oh man I cant believe I just saw episode 20 of season 21. It is fantastic! I haven't liked a new episode this much in years. ... Just had to tell everyone. Today's the day that Lisa Simpson gets married ..
.. according to the sixth-season episode, Lisa's Wedding. Many, many, many, many seasons ago, Droo! Looks like that relationship didn't work out! To be fair, the marriage didn't 'work out' in the episode, either. The Daniel Radcliffe cameo sounds funny, even if it is a bit predictable. Besides, he's said that he's a huge "Simpsons" fan. That promo image is fantastic! One aspect that I think actually gets better with each passing year. The episodes themselves are still good, they just aren't as Halloweeny as the earlier seasons. Last years was pretty good in that regard, it even featured parodies from Hitchcock films. Have hopes for this one, even with the Twilight spoof. B) was extraordinarily rude to everyone. His (2! )messages were removed by the mods. You're in violation of TOS on the board and extraordinarily rude to boot. Last edited by GeorgeC on February 27th, 2011, 7:58 pm, edited 1 time in total. Guessing that a message has been removed here and George is not pointing fingers at Dacey! Well given that George edited his post, I'm guessing not. 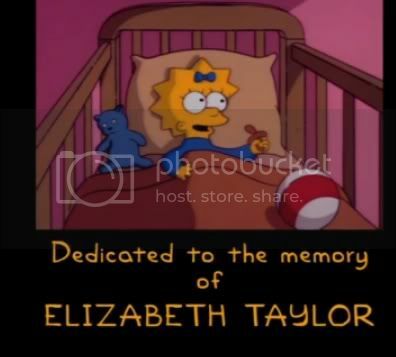 Speaking of, Fox is going to air that episode, Lisa's First Word, tonight at 8PM as a tribute. Will be nice seeing it again. Interesting review of the crossover (spoilers of course). I'll be watching that whenever it appears on Hulu or on Adult Swim, whichever comes first. But honestly, this is the only thing Simpsons related that has my interest right now. The fact that they killed another character on an episode the very same night that the crossover aired just felt like a plea for attention. Heads up to any one is interested that tonight's episode will be from a script Judd Apatow wrote roughly 25-years-ago. As noted, Apatow wrote the original spec script in 1990 when the show was six episodes in. He would go on to be a writer on The Critic before branching out to his current place in comedy film-making.